Deinonychus was a lightly built, fast-moving, agile, bipedal (walked on two legs), bird-like dinosaur. It was built to kill. This meat-eater had a curved, flexible neck and a big head with sharp, serrated teeth in very powerful jaws. Each of its three fingers on each hand had large, sharp, curved claws. It had four-toed feet; the second toe had a 5-inch (13-cm) sickle-like claw, and the other toes had smaller claws. Deinonychus also had a relatively large brain and large, keen eyes. 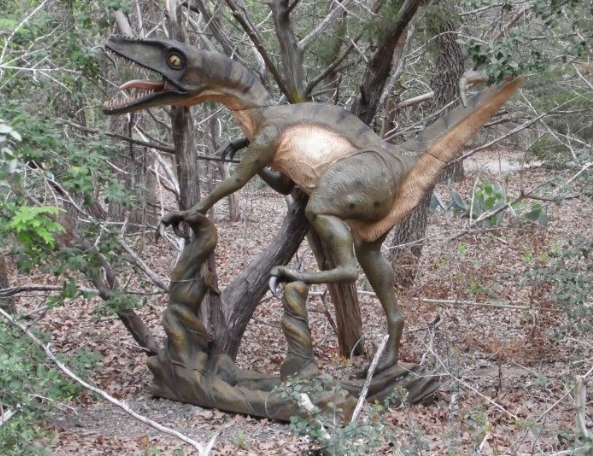 Deinonychus is part of the “raptor” family. This would have been the proper size raptor depicted in the movie, Jurassic Park since Velociraptors are actually quite smaller. One set of Deinonychus fossil and bones found in 1969 were found close to its egg, which scientists believe it was nesting on the egg. This meant dinosaurs might actually be warm-blooded, like birds. Before this, most scientists thought dinosaurs were cold-blooded, like reptiles.